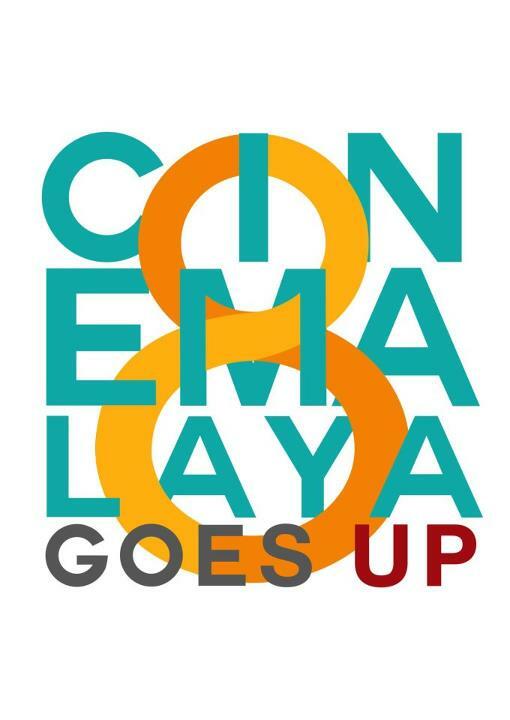 The UP Cineastes' Studio, in partnership with Moonleaf Tea Shop, in cooperation with Outpost Visual Frontier, Orange Segment Print and Design Studio, Universal Robina Corporation and Viva Turismo Iligan present CINEMALAYA GOES UP Year 8. 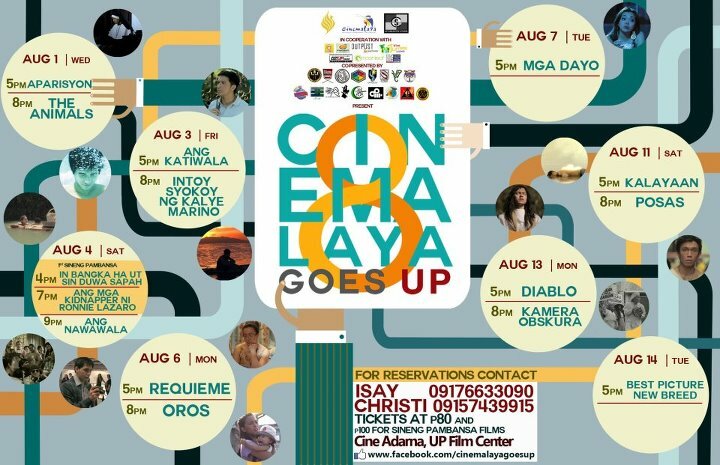 Catch the films running on August 1, 3, 4, 6, 7, 11, 13, and 14 at UP Film Center's CINE ADARNA. 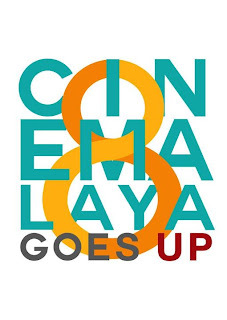 Cinemalaya Goes UP 8 is also brought to you by UP Academic Planner Project, Remnants Thrift Shop, Rodic's Diner, RC Fruit Shakes, I Love Sysig and Hong Kong Style Fried Noodles. NOTE: Bwakaw, Mga Mumunting Lihim, and Sta. 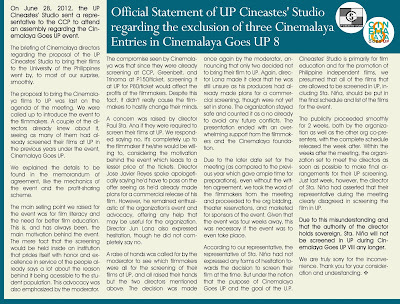 Nina will not be screened at UP Diliman, due to having prior arrangements of the said films for commercial releases. Please read below the statement below. 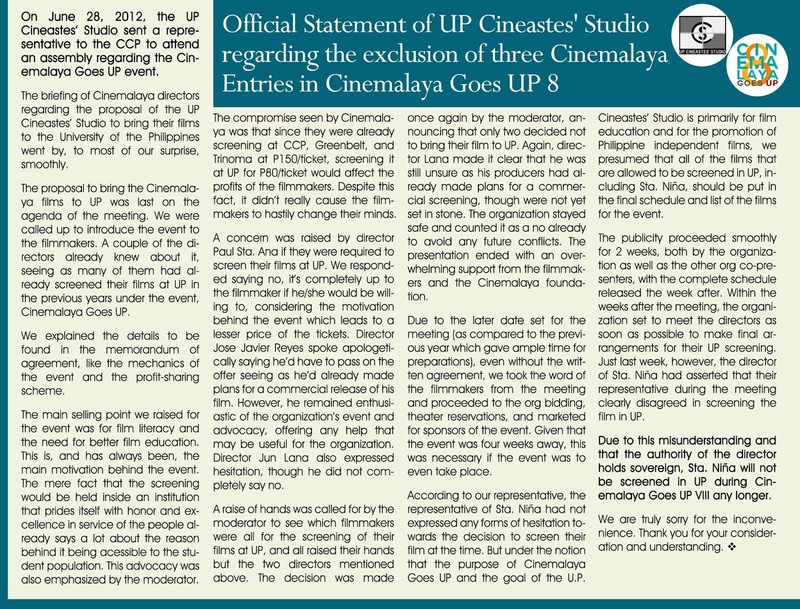 Ticket reservations of UP Cineastes for the ff films are already closed: INTOY SYOKOY, MGA KIDNAPPER NI RONNIE LAZARO, ANG NAWAWALA, OROS and POSAS. 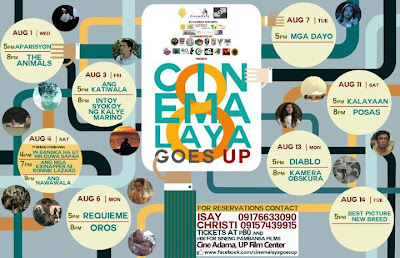 Reserved tickets must be claimed 30 minutes BEFORE the scheduled screening. Unclaimed tickets by then will be sold at the box office to accommodate the others.